Riad Mamma House i Marrakech, Marokko: Reservér nu! Welcome to Mamma House, one of the best hostel in Marrakesh close to everything. The Riad it self is created in the 19 century and renovated 5 years ago by keeping the same authentic decoration and respecting the Moroccan style. You will meet the wonderful team that will be with you during your stay, and they will take care of your holiday carefully. 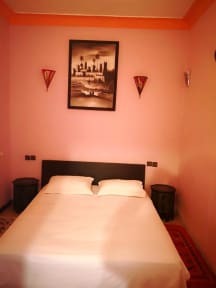 Riad Mamma House is located 07 minutes slow walking from the square which is the center of the old city 'The Medina' and 15 minutes walking to the center of the new city. Mamma House has a perfect location that will allow you to take a taxi easily in case you want to discover places that are far from the center,it's also close to all the beautiful gardens like Majorel Garden and the Secret Garden. All rooms are bright and luminous including private bathrooms in each rooms. Our wonderful staff will be with you during your stay, we are waiting for you!